Originally called the Chintamani Fort, the Junagarh Fort is an age old heritage site and one of the most sought after places to visit in the historical city of Bikaner, Rajasthan. Set amidst the Thar Desert (the Great Indian Desert), the fort complex is an extraordinary illustration of architecture and an exceptional center of art. Reflecting outstanding architectural design and excellent, the fort is one of the most impressive fort complexes in Rajasthan and India as well. This grand and historical Junagarh Fort was built by Raja Rai Singh, the sixth ruler of Bikaner, who ruled from 1571 to 1611 AD. He appointed his Prime Minister, Karan Chand, to supervise the construction of the fort complex. The Raja himself was an expert in arts and architecture. You can see several monuments built by Raja within the fort complex depicting his knowledge of art and architecture. The entire fort complex is built in red stone and marbles. Several additions and decorations were made to the Junagarh Fort Complex by later rulers. Karan Mahal Palace: Karan Mahal is one of the most notable attractions within the fort complex. It was built by Karan Singh, who was the Prime Minster of Raja Rai Singh, to mark his victory over the Mughal Emperor Aurangzeb in 1680. The palace is considered as one of the most elegant and beautiful palaces built with gardens depicting aesthetic sensibilities of the royalty of royal Rajasthan. The stained glass windows and intricately carved beautiful balconies built in stone and wood fluted columns still attract much attention. More floors and decorations were added to the Karan Mahal Palace by later rulers. Anup Singh and Surat Singh made substantial addition to the palace. They added extraordinary decorations to this palace with intricate mirror works, red & gold paint, and inlaid polychrome glass. Anup Mahal: Anup Singh refurbished the Karana Mahal Palace with a Diwan-i-Aam (the Hall of Public Audience) and called it Anup Mahal. It is a multi-storey structure and considered as one of the finest constructions in the fort complex. The Anup Mahal exhibits beautiful art and architecture in form of ornate wooden ceilings with inlaid mirror works, fine lattice windows, beautiful balconies, and superbly incorporated Italian tiles. You can also see here gold leaf paintings. Anup Singh also built Zenana quarter, royal dwelling for females. Phool Mahal: The Phool Mahal is the oldest part of the Junagarh Fort & Palace Complex. It was built by the King Raja Rai Singh himself. The interior walls of the rooms inside the palace are superbly decorated with stucco work and glass inlay works. You will be amazed to see the decoration of this palace with motifs of trays, rose water sprinklers, and flower vases. Exploring these decorations at the palace will remind you the decoration popular in Jehangiri period. Jhoola inside the Phool Mahal is a key attraction. Chandra Mahal: Chandra Mahal is one of the most impressive and luxurious palaces built within Junagarh Fort Complex. This beautiful palace was refurbished by Gaj Singh, who ruled from 1746 to 1787. It has luxurious rooms. You can also see here gold plated deities and beautiful paintings dotted with precious stones. Ganga Mahal: The Ganga Mahal in the Junagarh Fort was constructed by Ganga Singh in the 20th century. This palace has a large Durbar Hall known as the Ganga Singh Hall. The hall houses a museum war weaponry and also a well-maintained World War I aeroplane (biplane). Badal Mahal: The Badal Mahal (The Cloud Palace) is an extension of Anup Mahal. It is known for is exquisite wall paintings. You will be amazed to see beautiful fresco paintings of Hindu God Krishna and his consort Radha amidst the rain clouds. 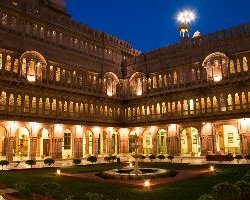 Bikaner Havelis: There are several beautiful havelis located within and outside the historical Junagarh Fort. These havelis are known for their unique architectural style. Fort Museum: The museum within the magnificent Junagarh Fort, called the Junagarh Fort Museum, was established in the year 1961 by Maharaja Dr. Karni Singh under the control of “Maharaja Rai Singh Trust”. The museum is very popular among tourists exhibiting Sanskrit and Persian manuscripts, royal costumes, jewelries, farmans (royal orders), miniature paintings, enamelware, silverware, howdahs, war drums, palanquins, and headgear, costumes, and dresses of god’s idols. The museum also exhibits armory collection of post medieval arms. Massive Gates: There are several architecturally beautiful massive gates that provide access to various monuments in the historical Junagarh Fort Complex. Prominent gates are Karan Pol, Suraj Pol, Fateh Pol, Chand Pol, Daulat Pol, and Tripolia Gate. These all gates depict excellent architectural style.